Beetroot juice is taken for many purposes, from aphrodisiac use to boosting exercise capacity to supporting liver and eye health. The supplement is rich in vitamin C, magnesium, manganese, potassium, bioflavonoids and beta-carotene. A concentrated beetroot extract, called betaine, is taken to maximize liver detoxification, to boost natural production of hormones in the body that promote the feelings of well-being and relaxation, and to remove excess homocysteine in the urine and blood. Homocysteine is related to a higher risk for heart disease. Both forms of beetroot can have side effects. 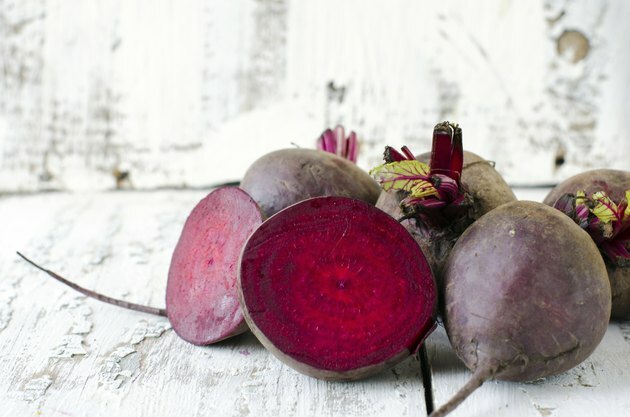 Excessive consumption of beetroot should be avoided by people with hemochromatosis or Wilson disease due to the potential for copper and iron accumulation, advises Drugs.com. Hemochromatosis is a form of iron overload disease, while Wilson disease is a disorder that prevents a person's body from ridding itself of excess copper, according to the National Digestive Diseases Information Clearinghouse. Between 12 and 14 percent of the population experiences red urine and coloration of blood after consuming beetroot, according to the British Medical Journal. Known as beeturia, this coloration has no apparent consequence, according to Drugs.com. Betaine most often has mild side effects that include nausea, stomach upset and diarrhea, according to UMMC. However, people who have kidney disease should avoid betaine, as it can increase total cholesterol levels when it's taken along with folic acid and vitamin B6. People usually are advised to take betaine in conjunction with these vitamins as well as vitamin B12. Obese or overweight people also need to check with a doctor prior to taking betaine, as it can raise cholesterol levels. People who have kidney disease need to discuss taking betaine with a health care professional, advises UMMC. Pregnant women should approach betaine with care, as it has a "C" rating for use during pregnancy, according to the Mayo Clinic. That rating means that studies in animals have shown an adverse effect or that no adequate studies in pregnant women exist. Safety information on regular beetroot use by nursing or pregnant women is lacking, advises Drugs.com.